Taiwan's textiles sector is renowned in the world, but it faces a shortage of factory manpower. As a result, Taiwanese manufacturers are increasingly turning to automated processes. 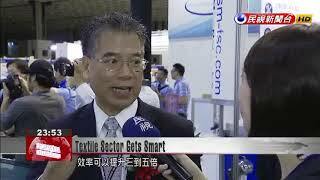 At this year's Taiwan International Textile & Garment Machinery Exhibition, over 300 booths are showcasing the latest they have to offer in automated production. This electronic sewing machine can rotate 360 degrees to stitch intricate patterns on a garment within minutes. And then there’s this digital heat press machine. Just cover the cloth with a sheet of dye, press on high heat for 40 seconds, and the beautiful colors are transferred to the white fabric. With this machine, cutting fabric is made easy. This is what we call industrial revolution. As long as you can press a button on a computer, the machine will cut the fabric for you. It replaces a vast amount of manpower, improving efficiency by 3 to 5 times. There’s another machine that’s even more amazing. It can fold 12.5 pieces of clothing in a minute and pack them in plastic bags. Another manufacturer has developed an automated sorter that separate items by color, size and even their delivery routes. Traditionally, we separate and sort products by sight. It’s time-consuming. This visual recognition system can photograph and scan items. It can sort them right away.